UPDATED: The arterial "circle of Willis" is a roundabout of arteries found at the base of the brain, allowing for collateral circulation at this level. This arterial circle has been described by many anatomists, but it was Thomas Willis (1621 - 1675) who described it in most detail, and he was the first to understand its function. The circle of Willis receives blood from the two main paired arteries that provide blood supply to the head and brain: the carotid arteries anteriorly, and the vertebral arteries posteriorly. The arterial circle of Willis provides all of the arterial blood to the brain. Cerebral blood flow in humans averages 55 mL per 100 g of brain tissue per minute. This is a about over 742.5 mL/min for the average 1350 g brain. Depending on the situation the brain will use between 15 to 20 percent of the total cardiac output, although by weight the brain is only about two to three percent of the average body weight. Incredibly, the brain uses more oxygen that most organs averaging close to 25% of the total oxygen needs of the body! 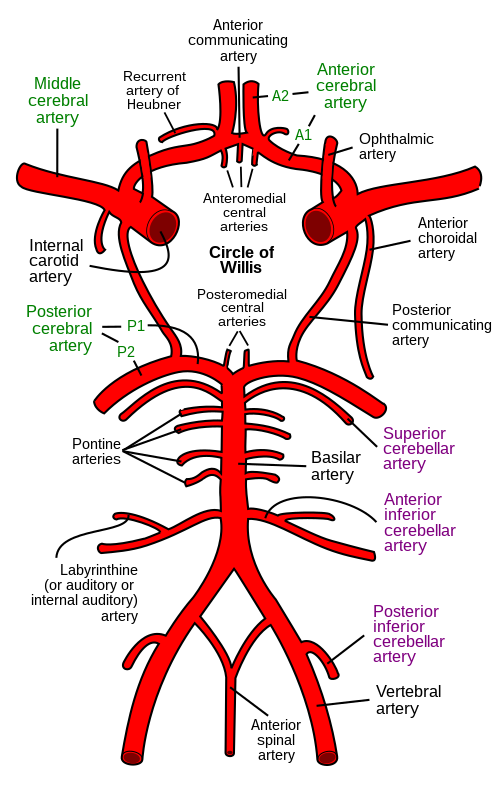 The importance of the arterial circle of Willis is that beyond this point the arterial supply to the brain becomes terminal, that is, there are little or no anastomoses between the bifurcating branches exposing the brain to ischemia and necrosis should there be an arterial stenosis or stricture. The circle of Willis is an area prone to aneurysms, with over 27,000 cases yearly in the US. For an image of the vascular territories of the brain, click here. Clinical anatomy, pathology, and surgery of the brain and spinal cord are some of the lecture topics developed and delivered by Clinical Anatomy Associates, Inc. Thanks to Jackie Miranda-Klein for making me review this post and update it!... and congratulations to Jackie for starting her Physician Assistant Master's degree at Kettering College. Dr. Miranda.